Dip below the rim and hike a remote section of the Tonto Trail. A note on water: The lack of water on this route makes it a serious undertaking. Descending the tributaries to the Colorado River requires technical skills. Be sure to have backup plans if water sources come up dry. Seasoned Tonto Trail hikers know the drill – flat walking following the path of least resistance across benches and around tributaries. The trail is faint and hard to follow in places. Follow Boucher Creek downstream to its confluence with Topaz Canyon. Cairns mark a route up the west side of the drainage, and you climb about 500 feet up to the top of the Tonto Platform. Now the contouring begins. The trail works its way around Marsh Butte and heads back into Slate Creek. Cross a terrace of Tapeats Sandstone, picking up the trail on the opposite side of the Slate Creek drainage. 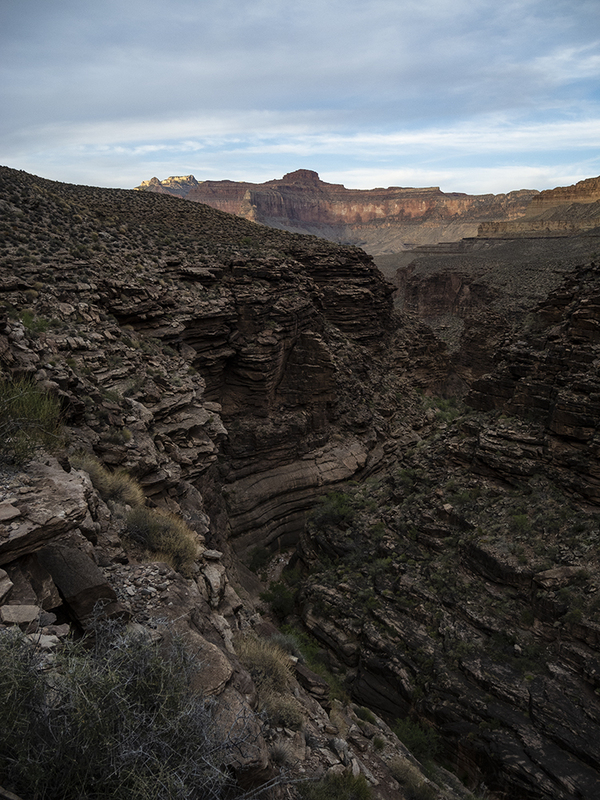 As you work your way back toward the main canyon, enjoy views of Slate Creek’s Tapeats narrows. Pass a squat, flat-topped tower called Scylla Butte. 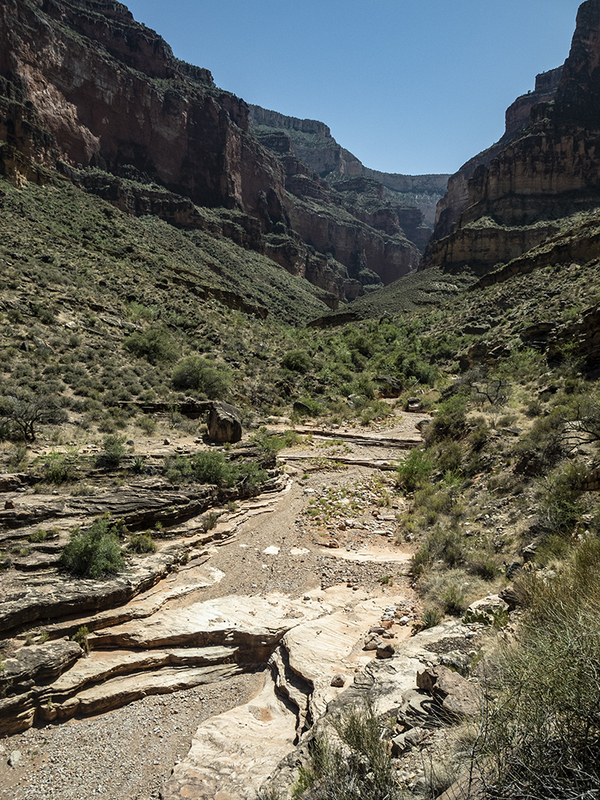 Across the canyon, Crystal Creek flows down from the North Rim. 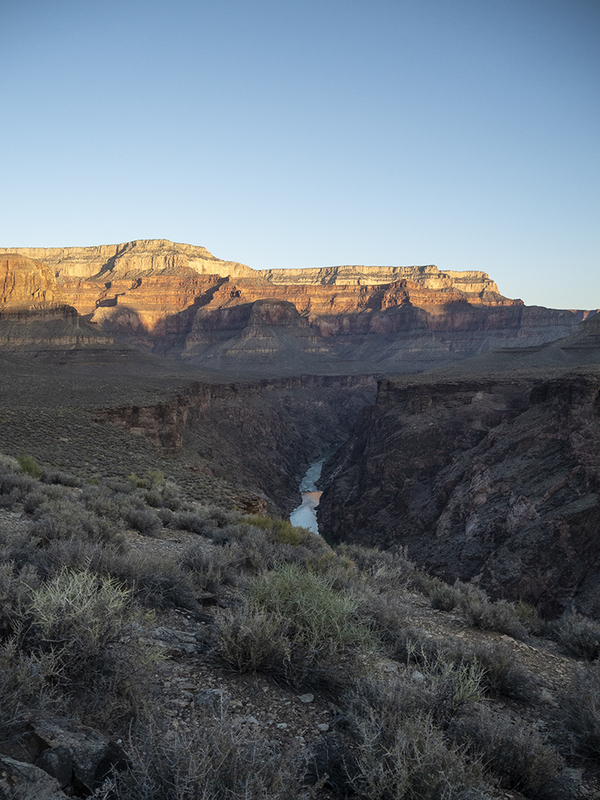 Though you can’t see the rapid at its mouth, it is one of the Grand Canyon’s fiercest rapids. The trail rounds Geikie Peak and crosses some small, unnamed drainages. Agate and Sapphire are much smaller compared to the other gems. You cross both of them quickly. While you can’t count on finding water along any part the route, these canyons are the least likely to have it. The trail contours below Castor Temple and works its way back into Turquoise. There are springs above where the trail crosses the drainage, but again, don’t count on finding water (most likely to find water in the fall, winter, and spring). From Turquoise, walk toward the mainstem Colorado. Scorpion Ridge stands out on the north side of the river. Try to spot the stone pincers as you hike across Shaler Plateau. Contour in and out of two unnamed drainages and around Le Conte Plateau before reaching Ruby Canyon. Certainly by now, the pattern should feel familiar. The route from Ruby to Serpentine is about 5 miles. You cross several unnamed drainages and benches along the way. Depending on the time of year, you might find water where the trail crosses Serpentine Canyon. From Serpentine, the trail goes back toward the mainstem Colorado and rounds a promontory of rock called the Grand Scenic Divide. You have excellent views of the Colorado River and granite gorge below you. In a mile and a half, the trail turns south into Bass Canyon. You drop to the floor of Bass about 28.5 miles from where you initially picked up the Tonto Trail at Boucher Creek. From here, you can head up to the South Rim via the Bass Trail or continue down to the Colorado River. If heading to the river: Cairns mark well-traveled paths across benches (much preferable than walking in the creek bed). As you near the Colorado River, look for a route on the left that climbs out of Bass Canyon. Bass Canyon ends in a huge, impassable pouroff. Follow the footpath downstream, and pick your way down a rocky slope to a beach by the river. Since the Tonto Trail starts 5,000 feet below the rim, driving to the trailhead is not an option. You must get there by foot. See the Boucher and South Bass trail descriptions for more information. Park entrance fee required. 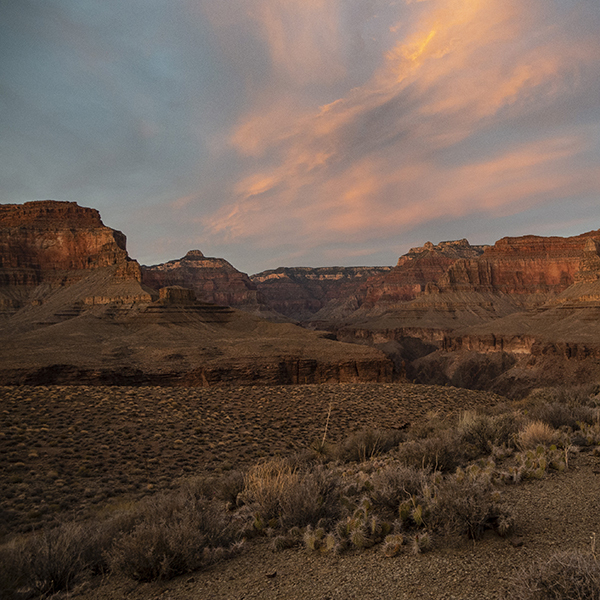 Camping below the rim requires a backcountry permit and additional fees. See website below for current information. Love the canyon? Help protect it from uranium mining! 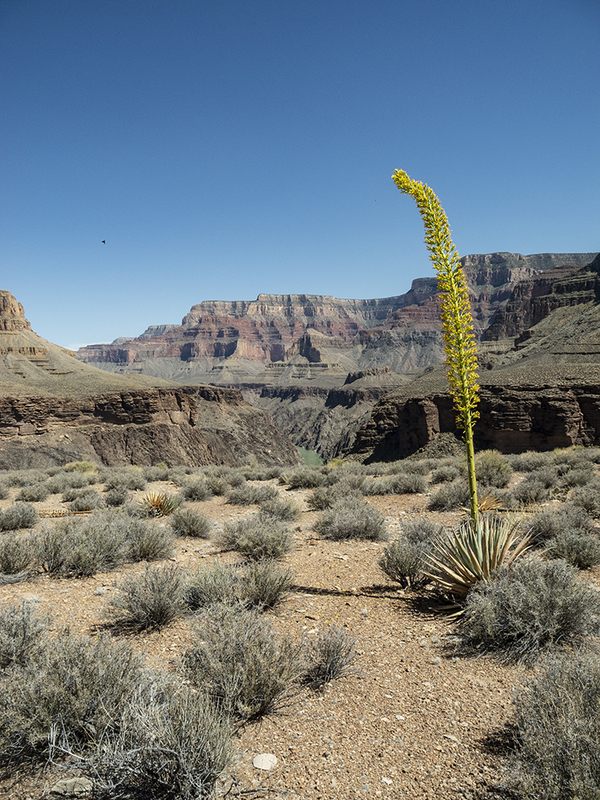 Urge your members in Congress to support and co-sponsor the Grand Canyon Centennial Protection Act, which would permanently protect about 1 million acres of public lands around the Grand Canyon. 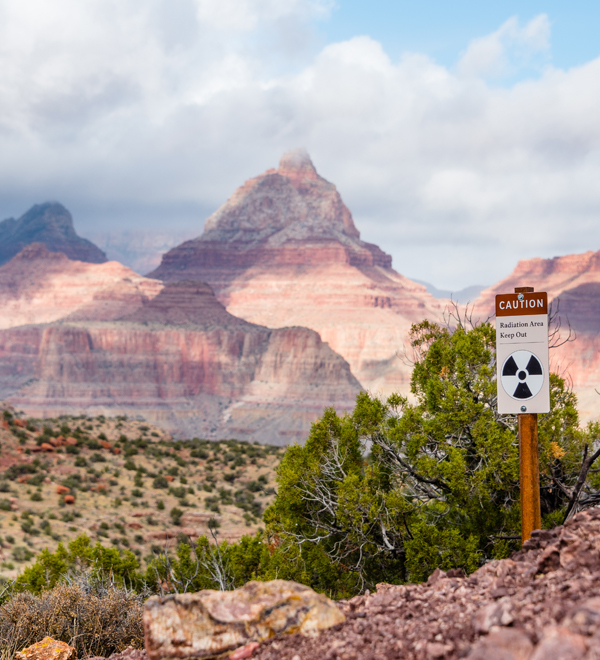 Water is life in the Grand Canyon, but uranium mines located on public land mere miles from the North and South Rims threaten to contaminate the Grand Canyon's waters. The Park Service warns hikers not to drink out of several creeks along the Tonto Trail because of contamination from a uranium mine that closed in 1969.